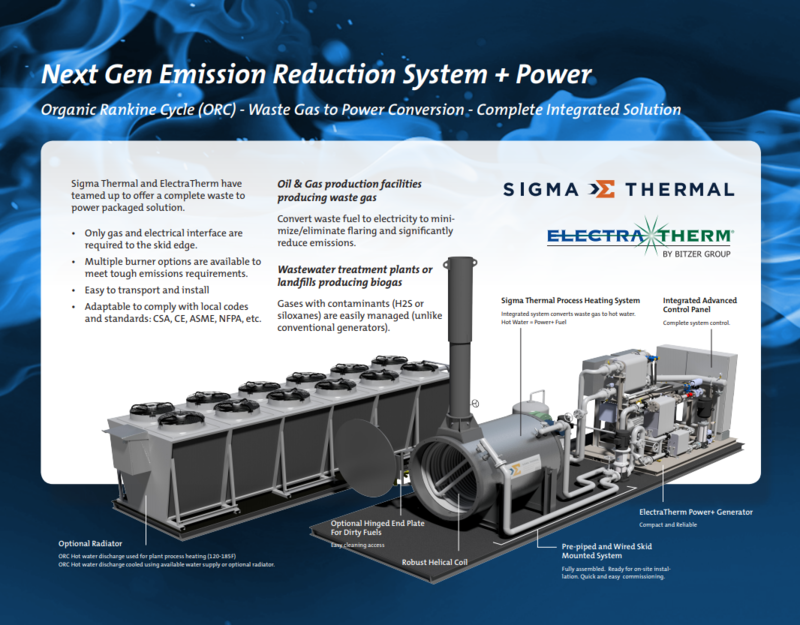 (MARIETTA, GA., – August 29, 2018) – Sigma Thermal is pleased to announce their partnership with ElectraTherm to offer a complete waste gas-to-power packaged solution. The packaged solution is called the Emission Reduction and Power System and is comprised of Sigma Thermal’s process heater and ElectraTherm’s compact and robust organic Rankine cycle generator to offer solutions for oil and gas facilities, wastewater treatment plants, and landfills. This integrated waste gas-to-power solution can assist industrial users with meeting tough emissions and local code requirements. It is easy to transport, install, operate and can also produce power from an unutilized resource. Within the integrated package, Sigma Thermal’s process heating system is being utilized to convert waste gas to hot water, which provides the energy needed to power ElectraTherm’s Power + Generator®. Options are available that allow for a supply of hot water discharge that can be used on-site, and a hinged end-plate is included on the heater to provide easy access for dirty fuel cleaning. The entire skid mounted system is delivered with interconnecting piping and wiring and is ready for quick and easy on-site installation. This partnership has enabled us to produce a solution that can dramatically lower on-site emissions related to flaring and produce electricity from a resource that would otherwise be considered a nuisance. In oil and gas production and refining facilities, where natural gas is being flared, the system can be used to convert waste fuel to electricity, minimizing (and potentially eliminating) flaring while significantly reducing emissions. At wastewater treatment plants and landfills producing biogas, the emission reduction system (as opposed to conventional generators) allows for easier management of gases containing hydrogen sulfide or siloxane contaminants and can contribute to the sites renewable energy goals. Interested in reducing emissions at your industrial site or plant facility? Contact Sigma Thermal or call us +1 (678) 616-2820 for more information about our integrated waste gas-to-power solution. Sigma Thermal, headquartered in Atlanta, GA, engineers and manufactures process heating systems that are utilized across many industries worldwide. The company has a range of industrial engineering experience that allows them to produce quality, cost-effective heating solutions. They deliver reliable systems that can achieve high performance without compromising quality or safety. Sigma offers hot oil/thermal fluid, direct fired (API), indirect water bath, electric, and biomass-fired heating systems. They also provide additional waste heat recovery solutions. For more information about Sigma Thermal, please visit www.sigmathermal.com. ElectraTherm, Inc. is a renewable energy company headquartered in Reno, Nevada. ElectraTherm’s product, the Power+ Generator®, generates fuel-free, emission-free power from low-temperature waste heat using the Organic Rankine Cycle (ORC) and patented technology. Their machines are modular, robust power generators with an attractive return on investment. For more information on ElectraTherm and its clean energy products, please visit www.electratherm.com. (MARIETTA, GA., May 18, 2018) – Sigma Thermal and Flaretec are excited to announce that the two companies have joined forces, and Flaretec will now be a part of the Sigma Thermal group. “We are excited about the new partnership between Sigma Thermal and Flaretec, and the opportunities it will bring to the industrial businesses in the surrounding region,” said Flaretec Managing Director Scott Brewster. This merger will allow industrial process heating equipment and services to be provided on a global scale, ensuring higher efficiency, enhanced cost-effectiveness, and extended local market support. With international customers increasingly seeking single-point sourcing for process heating design, engineering, manufacturing, and aftermarket support, the new partnership comes at an opportune time, allowing for the delivery of complete system solutions. Over the coming months, the new partnership, under the name of Sigma Thermal Middle East, will be opening an office in Dubai. Local sales, projects, and aftermarket staff will support regional customers, while the original Flaretec office in Chesterfield, England, will remain in operation to serve the European marketplace. Flaretec has been designing, manufacturing, and servicing direct and indirect fired heaters since 1979. The company has an installed base of over 2,000 fired heaters and ancillary process systems worldwide, with a heavy concentration in Europe, North Africa, and the Middle East. With more than 70 years of combined engineering experience, Sigma Thermal has engineered and manufactured countless process heating systems — including thermal fluid systems, indirect process bath heaters, biomass-fired energy systems, and electric process heaters — used across diverse industries worldwide. Sigma Thermal, a privately held Georgia corporation, was founded on the belief that exceptionally deep engineering knowledge, applied practical field experience, and real customer service are the keys to successful system design and project execution. These principles form the underlying framework of the company and are tightly held by all Sigma Thermal employees. The company designs, engineers, supplies, and services process heating systems for industry, including thermal fluid heating systems, indirect process bath heaters, electric process heaters, biomass-fired energy systems, direct fired process heaters, system automation, parts, retrofits/upgrades, and support services. Since Flaretec’s formation in 1979, Flaretec has become a global market leader for the design and manufacture of quality specialist products related to API type, direct and indirect fired heating equipment across a variety of industries including the Oil & Gas, Petrochemical, Marine, Power, and Pharmaceutical industries. The company continually forges global business relationships through delivering cost-sensitive, innovative engineered solutions to meet clients’ specific needs and strives to deliver a quality and reliable product and service every time. As you are a customer and/or operator of GTS Energy or Newpoint Thermal process heating equipment we wanted to share some exciting news. The GTS Energy and Newpoint Thermal heater brands are now part of Sigma Thermal. GTS Energy has been a leading provider of Process Heating Equipment for global industrial applications for 30 years, with three of those years under the banner of Newpoint Thermal. We are proud to make this product portfolio part of the Sigma Thermal family of products, and we are excited to welcome you to Sigma Thermal. Sigma Thermal is committed to providing the very best process heating products and first-class aftermarket support for those products. We have a very knowledgeable applications engineering group to support your new plant or expansion projects, and an experienced and helpful aftermarket services group dedicated to supporting your installed equipment. If you have GTS or Newpoint Thermal equipment already installed, we can fully support your installations.